The College Sports Information Directors of America (COSIDA) has selected Wabash's football media guide as the best in all of NCAA Division III and NAIA. The 2009 Media Guide is compiled each year by Sports Information Director Brent Harris. The 2009 guide featured a cover designed by Public Affairs' Kim Johnson. "All of us in the Advancement Office are proud of the work Brent does, year in and year out. He's really one of the top sports information directors in the country — at any level," Director of Public Affairs Jim Amidon said. "It's a great tribute that the leadership of CoSIDA honors Brent's work with the football media guide. Wabash has such a tradition-rich football program and Brent takes great pride in that tradition, and the media guide is proof of that. Each year the book gets better and better, and with Kim Johnson's design help, the 2009 guide reach an all-new level. "As a former sports information director who produced the football annual for about 10 years, I know how painstaking that work can be. And Brent does it better than anyone I know." 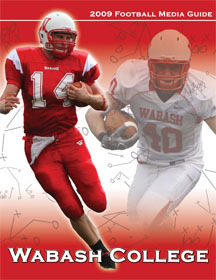 The Wabash media guide was selected best from 20 entries. The media guides from Millsaps, Kenyon, and St. John's rounded out the top four.